When my daughter wakes up from her nap, the first question she often asks is "mommmy, can we bake?" Do I want flour all over my counter? Do I want that gritty feeling of sugar under my feet until the next vacuum session? Do I want to stain treat a shirt with chocolaty batter on it? Why yes, yes, and yes! Ever since my daughter was old enough to know what cooking and baking was, she has helped me. She's getting pretty good, so the clean up is getting easier. The biggest battle right now is to keep her from eating large quantities of raw cookie dough, batter, or other delightful ingredient. However, beater licking is an important job, and I would never deprive her childhood of that. A few days ago she woke up and said she wanted to make muffins. "Lotsa lotsa lotsa chocolate muffins", was her exact request. 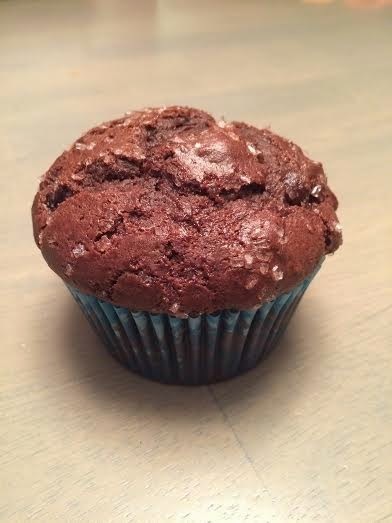 So, one of the first Pinterest hits was this recipe for "Double Chocolate Muffins". The batter was very, very thick and the end result was a heavy, but delicious, super chocolaty muffin. However, like a bakery, day olds in this case are not that desirable. I recommend gobbling on the first day. They are still great after the fact, but they are definitely like a heavy, day old muffin. Even I can make an apron!